eTrack Timesheets are very simple to use and yet are very powerful allowing staff to enter weekly time and expenses on a single screen. All the features you are likely to need now and in the future are included, or can be hidden for simplicity. 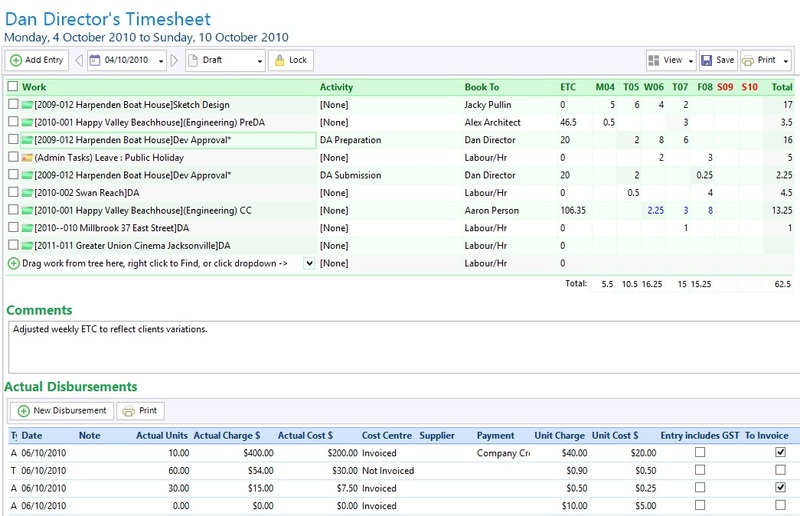 Time and expenses are fully integrated with accounts, invoicing, budgets and schedules. If you are using the Schedule feature, actual time is graphically shown and estimates are automatically updated and dependent work moved. Fast to complete to encourage staff to use every day. Intuitive to use so minimal training. Rich in features (or hide to keep simple). Fully integrated with schedules and accounts. Fast selection of work by drag and drop, secure find or selection of assigned work. Auto populate entries from week to week. Personal ordering of work rows for ease of use. Edit hours to 2 decimal places or use the spin boxes, personally set up. Book time to multiple work activities within a day. Enter comments for a row or each ‘cell’. Hide, view only or allow editing of the Estimate to Complete (ETC). Configure to allow time to be booked to roles or other staff’s ETC. Select different Cost Categories such as Hour, Day, Shift, Overtime, Travel Time, Away from Home Nights. Control Status: Draft, Complete, Approve, Not Approved, Locked. Book time to Flexi-Leave / TOIL / Rostra days and track Flexi-Balance. Emailed exception reporting to prompt non complete or approved timesheets. Optionally interface with your other systems. One click to start timing the task you are working. Simply click a tree item or an existing timesheet entry. Auto insert hours onto timesheet. Pause, switch or change tasks and optionally edit hours add a comment. Configure your own Expense Types and units. Optionally provide a unit charge and unit cost. Plan expenses, record actual expenses and view totals and balance. 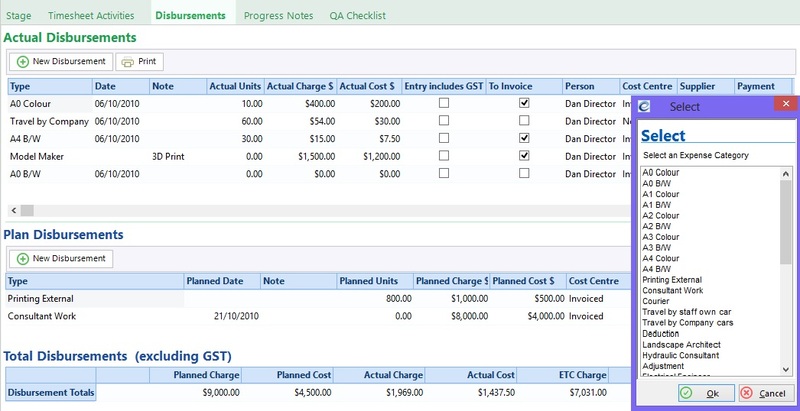 Include actual expense entry on the Timesheet screen. Fully integrated with Projects Budgets, and Accounts.